← Making travel your New Year Resolution? I felt the need to show youse the fruits of my labors this evening. 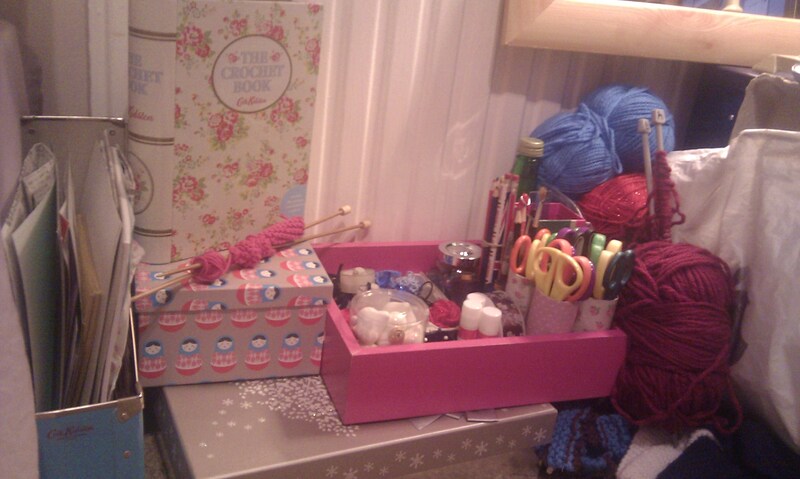 I have successfully stored and neatly arranged all my crafting materials. Ribbons and string, thread and needles, scissors and buttons, fabric and scraps, paper and ‘things’…. so much to store! I got really crafty and used the old egg cartons as individual storage for ribbon, wrapped my toilet roll tubes and created a scissor holder and found a use for the boxes used for my Christmas presents. From top, clockwise: egg carton segments used to store ribbon individually, jar of buttons, glass bottle full of sequins, various pens and pencils, many pairs of crafting scissors, ribbon reel, gluesticks, pins and needles, spare heart bobbles. From the side, I was more than just a little proud at how neat everything looked. Looks great! I need to organize my craft room. you know about similar discussion boards on any website? other similar forum where I can gain access to such content. Many thanks for some good information, I’ve shared this site on Facebook.